Thanks to a wealth of gameplay and an interesting setting, Fallout 4's Far Harbor DLC manages to succeed, despite suffering from some very questionable design decisions related to one awful quest. It is, however, a bit costly at $25.00. Few things excite me more than a new Fallout game and its post-launch DLC. There’s nothing like getting immersed within a great Western RPG, and this is a series that ticks all of my boxes. As such, it should come as no surprise that I was excited to hear that Bethesda would be taking us to a brand new location with Fallout 4‘s first large-scale expansion: Far Harbor. Located North of the Boston Commonwealth, Far Harbor is a large but remote island, which exists in isolation. It’s on that water-surrounded rock where three different factions – the human residents of the Far Harbor settlement, the synthetics who populate an old military institution, and a radiation-loving cult called the Children of Atom – live at odd’s end. Peace is nonexistent, war is on the horizon, and it’s up to the player to decide how things should play out. We enter this foreign land as a detective, and can only do so after meeting Nick Vallentine and completing his first quest in Fallout 4‘s main plot line. We’re there to look for and discover the whereabouts of a young, nineteen year-old woman, who’s travelled to Far Harbor in search of her true identity and has done so without sharing her plans with her distraught parents. However, what begins as a human fetch quest becomes a lot more once the boat docks on the island’s rocky shore. 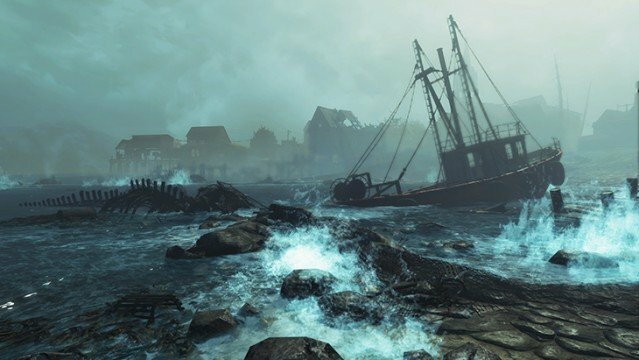 Despite being located away from the Commonwealth, Far Harbor wasn’t saved from the bombs. Then again, little was. As such, its once populated streets, hotels, military bases and satellite silos are all in varying degrees of ruin. On top of that, they’re all full of hideous creatures, ranging from mutated and irradiated zombies to hulking super mutants and deformed sea creatures. Danger lurks everywhere (although the enemies weren’t as plentiful as I’d expected them to be), and you’ll be up for a challenge if you go in with a lower levelled character. Don’t fear entering Far Harbor if your character is merely in his teens, however, as it’s definitely doable. I know, because the character I played through this DLC with entered at level 14 and left at level 23. 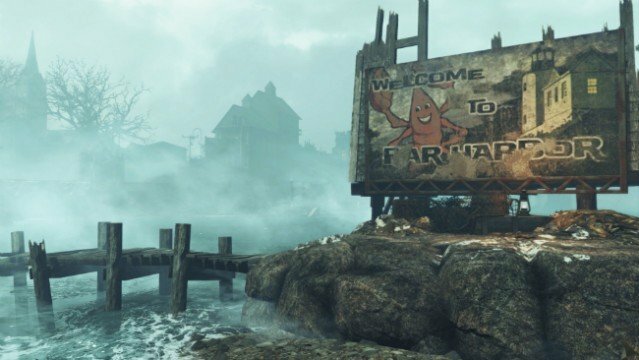 In addition to its dangerous mutants, Far Harbor is also host to radiation-filled fog, which the Children of the Atom happen to be responsible for. It’s one of the main reasons as to why you’ll want to make sure to pack a lot of Rad-X and Radaway before you set sails for this irradiated rock. I went through a ton of it during the ten to twelve hours that it took me to play through the main quest-line and do some sightseeing. For the most part, the storyline that this DLC presented was pretty interesting, although I found it to be lacking in depth in certain areas. As much as I wanted to care, I simply didn’t feel enough emotional attachment to any of the groups on the island, which was obviously disappointing. You do get to make some pretty major, dire and potentially violent choices, though, so that’s a definite plus. The environment, itself, is what I like the most about this first piece of major Fallout 4 DLC. Like Point Lookout before it, Far Harbor has its own look and personality, and the fog helps to sell that. It’s also huge, with tons of landmass to explore, along with a heck of a lot of notable locations. You’ll find destroyed hotels, ramshackle restaurants, caves, harbours and drive-ins, along with the steel bunkers that Fallout has become synonymous with. Needless to say, there’s lots to do, find and explore, and even though I’ve completed a lot of what this add-on has to offer, there’s still more that I want to do within its confines. That said, I don’t think I’ll ever do a second playthrough of its main quest-line. The reason? One particular quest that left me bored out of my damned mind and wishing for sweet release. It comes into play at the 60-75% mark, and tasks you with hacking into a synth’s old memories, which have been stored within a supercomputer. Although it sounds interesting, and like your average objective, the gameplay shift that it dictates has made it my least favourite Fallout quest of all-time. When you get to the supercomputer, after lots of trials and tribulation at the hands of challenging robotic enemies and bullet-based traps, you’ll find yourself dropped into the computer itself. There, you’ll be tasked with using Fallout 4‘s boring crafting system to move and position blocks. Said blocks are found in one area, then transferred to others, in order to create pathways for miniature drones. On top of that, they’re also utilized for solving puzzles, because whenever a red firewall is presented it must be taken out by a perfectly placed laser. The general idea is that you want to transport each puzzle’s green laser from one point of the map to another using block towers and special relay blocks that allow for a change of direction. It’s slow, plodding and incredibly tedious work, and it’s all done in an effort to create said pathway. Then, once you’re done with that, it’s time to plop a few turret defences down and hope that they’ll protect your drones from enemies as they attempt to hijack important data. Some have said that this particular quest is one of the worst things they’ve ever played, and while I don’t think I’d go that far, I must say that I didn’t enjoy myself at all during the two hours that it took me to complete its set of sleep-inducing puzzles. Upon completion of the last one, I almost jumped for joy, while wondering how something like that was ever considered to be a good idea. It’s important to note that I played through this add-on on the Xbox One. I’m making a point of mentioning that because it’s apparently the better of the two console versions. From what I’ve read, the fog plays havoc with Fallout 4‘s framerate on PS4. That’s not a notable issue on Xbox One, however, although the odd drop is natural in a game such as this. That said, I did experience a crash during my playthrough, which kicked me back to the console’s dashboard. At the end of the day, it’s hard not to recommend Far Harbor, despite its one major flaw and few more minor ones. Although it’s definitely not perfect, it’s a rich, detailed and rather immersive expansion for one of last year’s better games. So, if you think you enjoy Fallout 4 as much as I do – or even half that amount – then you should definitely give this expansion a shot, provided that you’re able to stomach paying its surprisingly high, $25.00 price tag.